In January 2005, via a simulcast meeting of the outdoor media attending the SHOT Show and SCI Convention, elected a panel of 10 outdoor journalists to serve as a steering committee to determine the viability of a communications organization focused wholly on the traditional outdoor sports. These individuals became POMA’s founding board of directors. Below are the biographies and testimonials of the founders, as they were published the day POMA was launched, June 19, 2005. Betty Lou Fegely is a full-time writer/photographer whose bylines and photo credits have appeared in North American Hunter, Turkey Call, Buckmasters and Women in the Outdoors as well as in encyclopedias and books. She is currently a columnist for Outdoor Adventurer and the NRA’s Woman’s Outlook. 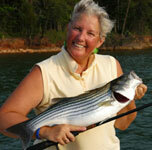 She has hunted, fished and photographed in Africa, Canada, Bulgaria and across the U.S., including Alaska. For the past 25 years Betty Lou has traveled the country doing specialty seminars on “Women In the Outdoors”, “Family Participation In the Outdoors” and “Wild Game From Field to Table”. She has served in an advisory capacity within the hunting industry on topics such as clothing, boots, optics, wild game cooking and archery, has served on the Board of the American Crossbow Federation and is a partner in B&T Outdoor Enterprises, a freelance writing, photography and publishing business. While success in any venture comes from hard work and dedication, one of the biggest reasons for any successes I may have enjoyed over the last 25 years is directly linked to a network built with other professionals in the traditional outdoor sporting community. A professional association should provide that networking capability, be proactive in helping with business related issues and provide a substantial return on membership investment. Membership in POMA will provide you with such an investment. Leadership is focused on the needs of its members. Freedom of expression is honored and individual members are respected. POMA fills a void for both beginners and veterans by providing a networking home for media professionals who cover fishing, hunting, shooting, trapping and other traditional outdoor pursuits. As a full-time freelancer, Laurie Lee Dovey has been crafting outdoor copy for 18 years, with an emphasis on hunting and fishing. Dovey has had over 1,600 articles and 600 images published and has received over 50 writing and photography awards. In addition to monthly columns, Dovey writes a wide range of hunting, fishing and technical features for dozens of international and U.S.-based publications. In November 2005, Dovey resigned from the board to serve as POMA’s executive director. POMA has a clear focus on the membership it serves and the business services its media and industry professionals want. This sets it apart from other organizations. I believe POMA is the hunting, shooting and angling media and industry professional’s most viable vehicle for business building and networking. POMA’s Irrevocable Charter ensures the group’s focus on the shooting and angling sports and interests, while the organization strives to help all members grow their businesses though high-level education, communication and membership services. Jim Casada sold his first article on the outdoors to Sporting Classics shortly after that publication’s initial appearance. He soon became a Senior Editor for the magazine and has been connected with it ever since. Since that time, he has had more than 3,000 magazine and newspaper articles published. In 1995, he took early retirement from his position as a university history professor to write full time. As a freelancer he writes three newspaper columns weekly, serves as a columnist or holds masthead positions with regional or national magazines including Predator Xtreme, Sporting Classics, Turkey & Turkey Hunting, Petersen’s Hunting, Cabela’s Outfitters Journal, Sporting Clays, and Tennessee Valley Outdoors, and writes 120-150 feature articles annually. In my view, POMA has the potential to be a major force for professional communicators and those striving to achieve that status. It offers those who cherish our sporting traditions a place where we belong and feel comfortable. I am an individual who proudly proclaims the enduring importance of hunting, fishing, shooting, trapping, and related activities. Communicating those activities will be the essence of POMA’s membership and cooperation with like-minded industry partners. Together we can grow, enhance our professionalism, and protect and perpetuate things we hold near and dear. I pledge to contribute, as an active member and someone who genuinely cares, to helping POMA achieve its fruitful promise to become an outdoor media organization where traditionalists can feel at home and where every member has the potential to grow, learn, and improve. Jim Zumbo sold his first article to Outdoor Life in 1963. Over the last 40 plus years he has had more than 2,000 articles published, along with 3,000 photos. He has written 23 books, has been a lecturer on big game hunting for 25 years and is now hosting a year-round TV show, “Jim Zumbo Outdoors,” on the Outdoor Channel. He has hunted all 50 states for deer, but is best known for western big game hunting. He is the Hunting Editor of Outdoor Life Magazine, having been in that position for 27 years, and freelances extensively. He sits on two Boards, the Rocky Mountain Elk Foundation, and the United States Sportsmen’s Alliance. I’m truly excited about POMA. Finally, we have an organization where the traditional outdoor sports are not compromised. Our members are on the same page, where hunting, shooting and fishing is our mantra. We make no apologies. Together we will grow within our industry, sharing our knowledge and making us better communicators, no matter what our specialty field is. I’ll make a personal pledge to be as active as I can, attending conferences, and serving on committees where I’ll work to make us the best outdoor media organization in the nation. That’s my promise. J Wayne Fears has been an outdoor writer since 1966. He has sold over 3000 magazine articles and 20 outdoor books. His book titled “Hunting Club Management Guide” was selected and the “Best Outdoor Book” in 2004 by the Southeast Outdoor Press Association. Also in 2004, Fears received the National Wild Turkey Federation Conservation Communicator of the Year Award and the Alabama Governor’s Conservation Communicator of the Year Award. He recently retired as editor of the Rural Sportsman magazine and is currently the editor of Hunting Camp Journal. At last, we have an outdoor writing organization where the traditional hunting and fishing writer can feel at home. POMA offers both the new writer and the seasoned pro many benefits that can help him hone his craft while enjoying the company of those who share a common interest. It is an organization where the industry can join the writers to further the outdoor interest of both parties and the readers/viewers/listeners will enjoy the results. I look forward to being a part of POMA. This is an exciting time in outdoor journalism. Having grown up in the outdoor writing world, I understand how important it is to have a professional organization for writers, photographers, and other communicators who specialize in hunting, fishing and related topics. Creative people often need help in learning to run their businesses better, and that’s much of what POMA is about – helping each other. If “timing is everything,” then the time is right for a group which understands what it is about, and who belongs. The essence of any “club” is being selective of membership, thus ensuring a commonality of interests and purpose. Many professionals in the firearms writing arena have felt that there was no organization for them. I suggest these writers, editors, and photographers make POMA their home. That’s where I’ll be. Tony Mandile has wandered the waters and woods for more than 40 years in pursuit of game and fish. During that time, he has fished or hunted in 39 states, 10 Canadian provinces, Africa, New Zealand and Mexico. He has been a full-time outdoor writer/photographer for 21 years, having served on the board of the Outdoor Writers Association of America and the Western Outdoor Writers (WOW). He also was a contributing editor for Arizona Hunter & Angler for 10 years and for seven years was the Arizona Editor for Outdoor Life. Mandile completed his first book project – “How to Hunt Coues Deer” — with noted guide Duwane Adams in 2003 and is currently working on a second book. His articles and photos have appeared regularly in 20 hunting magazines and other fishing, hunting, conservation and travel publications. More than 100 magazine covers have carried his credit line and his photos have also won numerous awards. The time is ripe for a new organization of professional communicators who wish to promote and support the positive aspects of hunting, shooting, fishing and trapping. The Professional Outdoor Media Association will not only provide that opportunity but will also help its members improve their craft and business practices. POMA will also recognize the role and importance those corporations, organizations, associations, agencies and other individuals play with their mutual interest to promote and support these traditional outdoor pastimes. I look forward to being part of POMA and helping it grow into the best outdoor communicators organization available and hope many others will join us in that effort. For more than 30 years, John has hosted a syndicated outdoor radio show and written about every aspect of the outdoors including freshwater and saltwater fishing, hunting, shooting, trapping, camping, hiking, riding ATVs and canoeing. His byline and photographs have appeared in more than 300 newspapers and numerous magazines. The author of 22 fishing and hunting books, John also is an internet content provider and consultant. He’s an award-winning writer who has been mentored by some of the greatest names in outdoor journalism. Today he enjoys working with young people to teach them the craft of outdoor writing and photography. “I’m more proud about what the young people I’ve worked with have done in the outdoor industry than anything that I’ve been able to do myself,” said John. I am proud to see that the outdoor industry has come together to form the Professional Outdoor Media Association. Those of us who earn a full time living as outdoor pros are of one heartbeat: to promote, to protect, and to encourage hunting, fishing, trapping and the traditional outdoors. Our purpose is to learn and become better business people and better journalists and to better take the pulse of the outdoor community. We want to report on what is new, valuable and interesting to those who hold the wild to be a part of their heritage. I encourage you to join us to promote the future of outdoor journalism and to assure your place in that future. Bryce M. Towsley is an award-winning writer and photographer whose work covers a wide diversity of subjects, but none more than the field of hunting and the firearms. Towsley published his first article in 1980 and in the time since has published hundreds of articles and thousands of photos in most of the major outdoor and gun magazines. He has worked as a full time writer and photographer since 1993. Towsley worked on American Rifleman Television for several years. He is a field editor for NRA American Rifleman, American Hunter and Shooting Illustrated magazines. He has completed six hunting or gun related books and contributed to several others. Growing up in the late 50’s in Pennsylvania, I lived a life highlighted by deer hunting every winter, trout fishing every spring, fishing on the Jersey shore in the summer and visits to the shooting range whenever the opportunity arose. As a kid, I also waited every month to vicariously experience the outdoor adventures of others from the pages of Field and Stream, Argosy and Boy’s Life. I admired – and still do — the skills of the writers who could turn simple words into mind pictures that gave me the experience and the knowledge while exposing a city boy to the freedom, adventure and opportunities of the great outdoors. I have been on the corporate side of the outdoor industry since 1981. I have also been actively involved with outdoor media organizations for more than 20 years, working with the professional communicators to help provide information and services that enable them to gather information that is beneficial to their audience. I will represent all corporate POMA partners to the very best of my ability. I am honored that I can offer my personal support towards helping to initiate and perpetuate the stated objectives of POMA. With the ever growing assaults on our personal freedom to hunt, fish or shoot from agenda organizations, there is a real need for a truly professional media organization that is dedicated to the true ideals of our heritage sports of hunting, fishing, shooting and trapping. POMA is dedicated to fostering quality education, not only for the public knowledge but also with strong commitments towards developing the next generation of professional outdoors communicators. POMA also recognizes the important role that our Corporate Partners play. This is the only outdoor media organization that has chosen to recognize the importance of the support provided for the growth and preservation of our heritage sports by the corporate community. I pledge to do all that I can to support all the objectives of this organization. POMA is amazing. The responsiveness to member needs is unheralded among professional organizations. POMA listens to our clients’ needs and reacts to them. POMA’s commitment to the industry shows at every conference. Our clients can’t afford to not be at the conference each year.